With its amply sized 14"W x 7"H two-way side disposal openings and 34 gallon capacity, this receptacle is perfectly suited for sites with high volume 2-way traffic. Fashioned with a covered top, this receptacle is just as prepared for outdoor use as it is for indoor. The Lasting Impressions Litter Receptacle, built for use in the modern world. Sharp crisp lines and contemporary design accents come together elegantly to make a bold upscale impression. 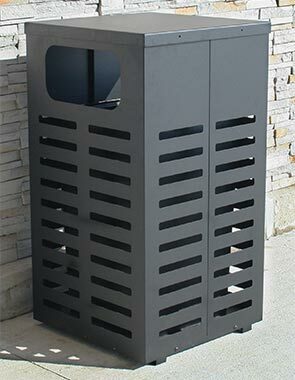 Constructed from durable 16 gauge steel with UV additive powder-coated finish ensures this litter receptacle will last long in to the future. ►Need a Litter Receptacle Fast?